We’d love your help. Let us know what’s wrong with this preview of Soul Tending by Anita Amstutz. We live in hungry times. There is economic uncertainty, fear, violence, division, and social chaos. What is needed for times such as these is a heart full of courage and wisdom grounded in compassion and resilience. For this, we can turn to one of the practices that for so many centuries nourished people of faith through incredibly difficult life circumstances and service. We live in hungry times. There is economic uncertainty, fear, violence, division, and social chaos. What is needed for times such as these is a heart full of courage and wisdom grounded in compassion and resilience. For this, we can turn to one of the practices that for so many centuries nourished people of faith through incredibly difficult life circumstances and service. Traditionally it was a communal gathering time of rest, ritual, and prayer. It is Sabbath keeping. 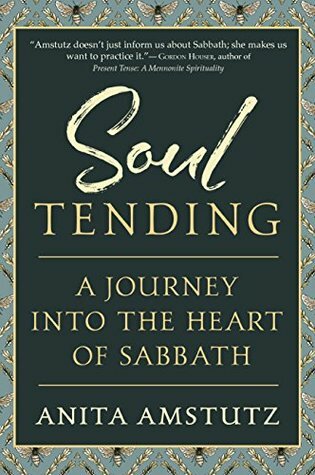 In Soul Tending, Anita Amstutz offers field notes and a road map from her own Sabbath keeping practice for the 21st century -- a practice rooted in tradition but whose tenets can be applied to practices fit for our present hectic and troubling world. To ask other readers questions about Soul Tending, please sign up. Do you remember a time when every Sunday started with three hours of church followed by a long meal, often roast beef and root vegetables that roasted in the oven while we sat in the pews? Perhaps the meal was shared with visitors or relatives. After the meal, the adults talked while the children ran outside to play. Maybe there were naps. Reading. Singing around the piano or organ. Farmers had to feed animals and/or milk cows. In the evening, there was another church service. No shopping, no vide Do you remember a time when every Sunday started with three hours of church followed by a long meal, often roast beef and root vegetables that roasted in the oven while we sat in the pews? Perhaps the meal was shared with visitors or relatives. No shopping, no video games, social media, movies, eating in restaurants, television. And no work except for preparing food and cleaning up afterward. Sunday was different from every other day of the week. It was a day of rest as decreed in the Ten Commandments. You worked as little as possible, and you tried not to cause someone else to work. How do you spend the Sabbath now? If you are like most of us, even if you attend church regularly, you don’t truly set aside the rest of the day from the daily hustle. Emails, commerce, purchased entertainment and the constant presence of smartphones with their addictive social media and news alerts — all these crowd the day and clutter the mind. They bury the soul. They starve it. “We live in hungry times.” So begins Anita Amstutz’s book about Sabbath keeping, a lost tradition in most of Western culture. Immediately the reader begins to feel pangs of remorse for a basic, unmet spiritual need. Amstutz begins by telling us her own experience of burnout in pastoring. Her busiest workday was Sunday, and she found it difficult to protect another day instead. The tone of her story is not judgmental nor self-pitying. Nor is it heroic. Told simply and with humility, the personal story augments the larger story of human longing for the divine. The real subject is not the author but that which the author seeks — to know and love God. This is memoir with a twist. It belongs in the spiritual meditation category and should be read lectio divina style, chewing one small bit at a time. Since hunger for God is the chief metaphor of the book, cooking seems like an apt analogy for reading the book. Among the skills of a great chef is reduction — the art of thickening and intensifying a liquid such as soup or wine or sauce by boiling and simmering. This is a book that benefits from the art of reduction. The answer might be, “Have you begun to keep the Sabbath as a practice yet?” If not, perhaps you need to give the hunger in your soul a little more food. This small book deserves its place on the shelf and in one’s life not only because it reduces other books to a thick, intense sauce, but because it moves from prose to poetry, speaking directly to the heart. If this passage does not induce you to want to go deeper with the Sabbath, nothing will. Amstutz could have written a nostalgic book about the rest she craved and the agrarian Mennonite traditions that offered pot roast in the oven after church and open-air harmonies.